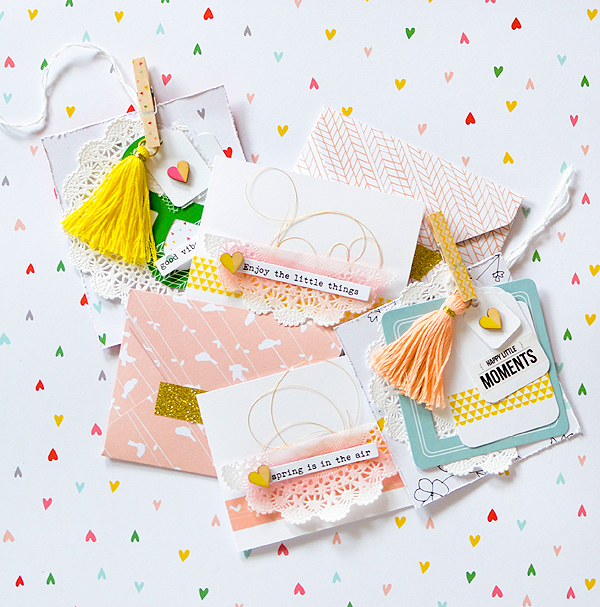 I made all of my projects with the new Felicity collection and I'm loving all the bright colors and the sweet, fresh feeling of the entire line. 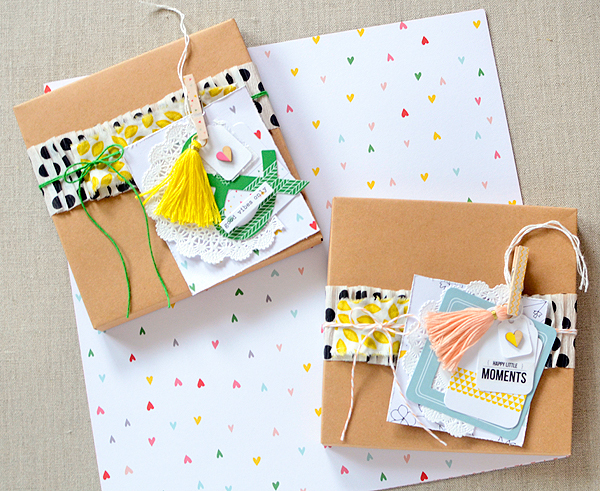 For my first project, I made gift tags to accompany some simply wrapped kraft boxes. 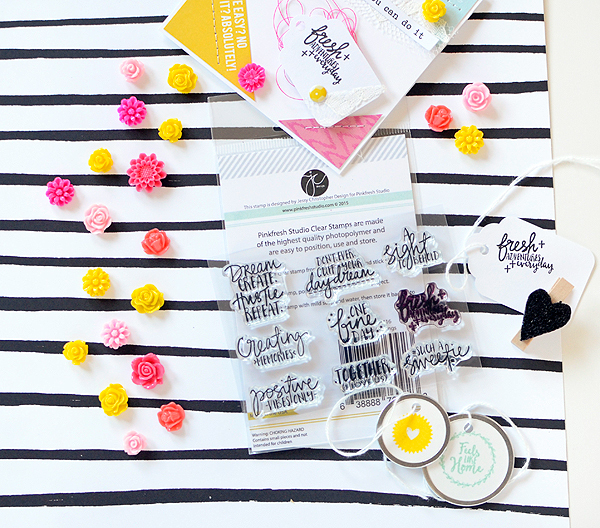 I wanted to highlight the bold colors of some of the elements so I used lots of white in my tags, which is a trend you'll see throughout the whole collection. 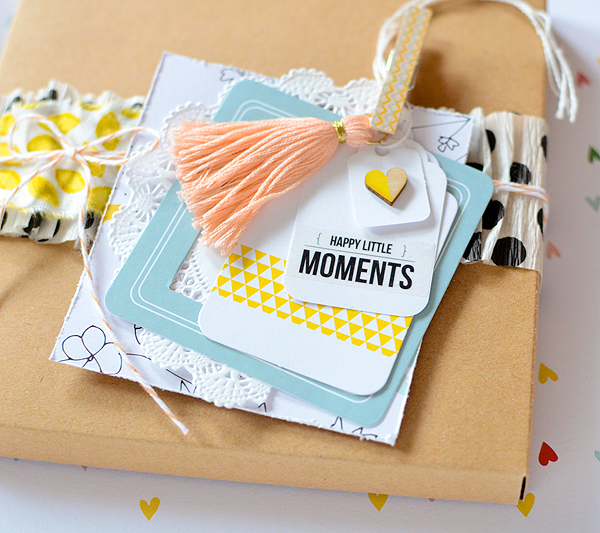 Taking a hint from the white and yellow triangle die cut tag, I minimally embellished a couple of other white tags; one with a wood heart, the other with the 'Happy little moments' washi tape. I used another strip of the washi to cover a mini clothespin which clips the tag to the package. I adhered the tape to the clothespin and trimmed off the excess with an X-acto knife. It's one of my favorite finishing touches! There is something I love about a bright green and yellow combination; maybe it signifies something new and cheerful--grass and sunshine? 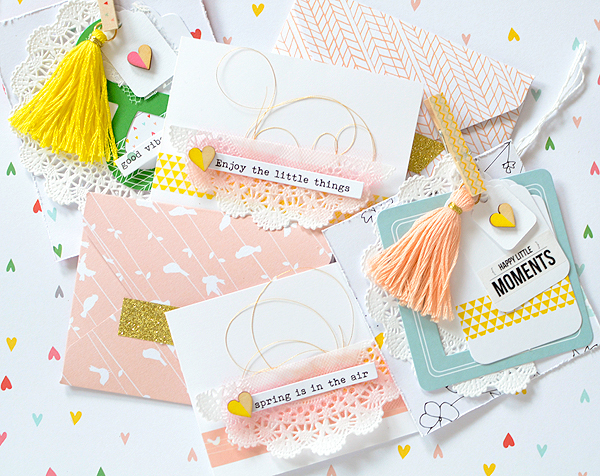 I'm not sure, but I felt the ampersand needed a sunny yellow tassel (and a little pink wood heart, too). 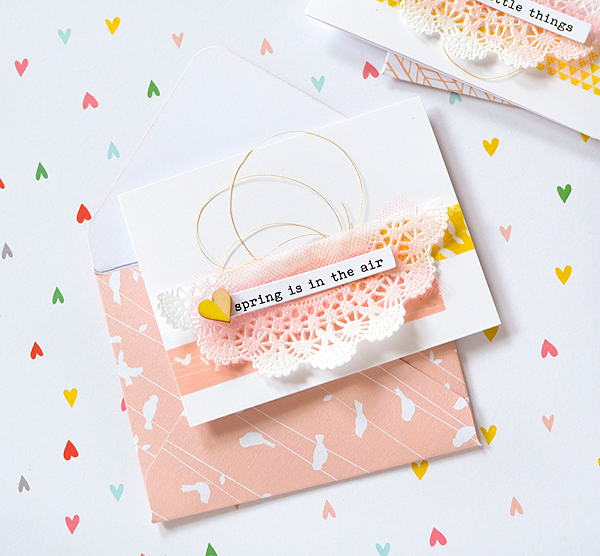 The heart paper is one of my favorites and I love that the pattern is replicated in washi tape (on the clothespin) and another die cut tag (peeking out from behind the ampersand). Nothing but good vibes here! Definitely trying to keep them going all year! I couldn't resist yellow again here; I personally love that Felicity boasts quite a bit of this color. 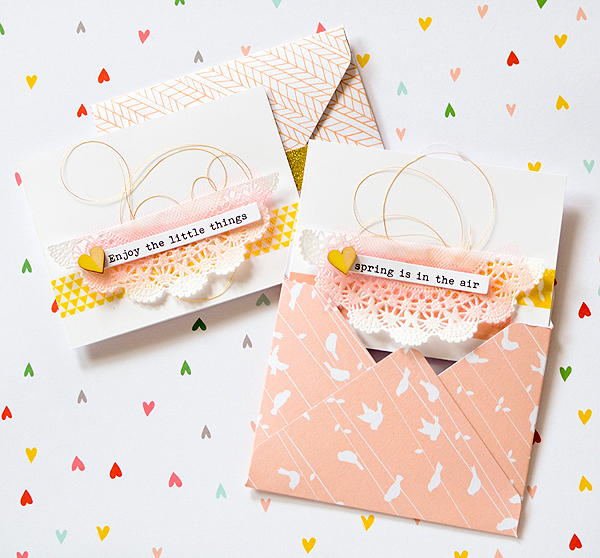 I paired it with peach again for a set of simple mini cards and envelopes. Wherever possible, I love to add texture. 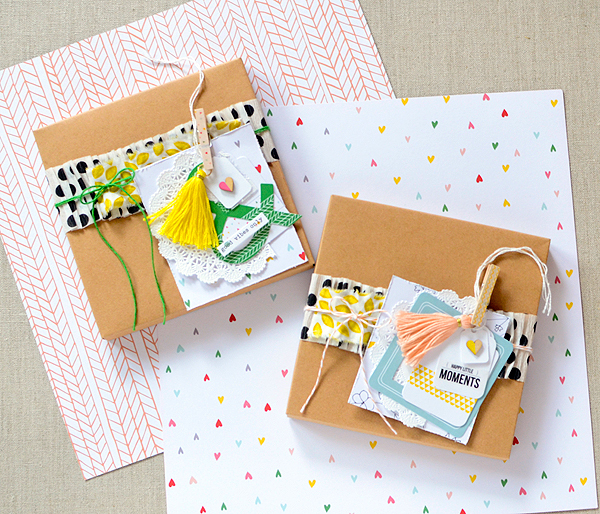 This small set has 7 kinds of it--washi, wood, thread, tulle, doily, glitter tape, and paper. 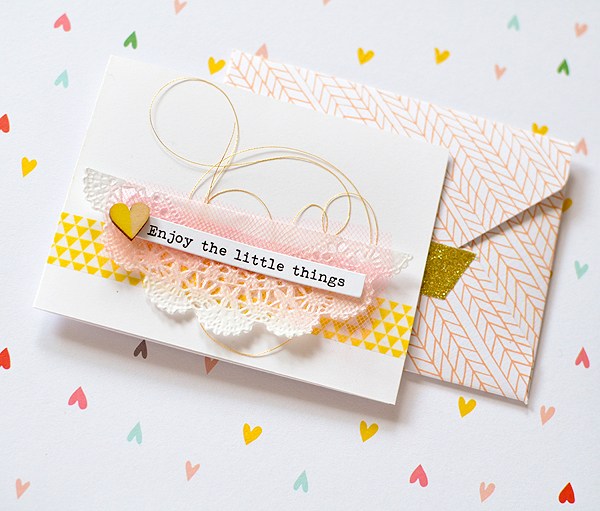 I adhered the yellow triangle washi tape to a 4 x 3 card base, then piled on my doily, tulle, and metallic gold thread. 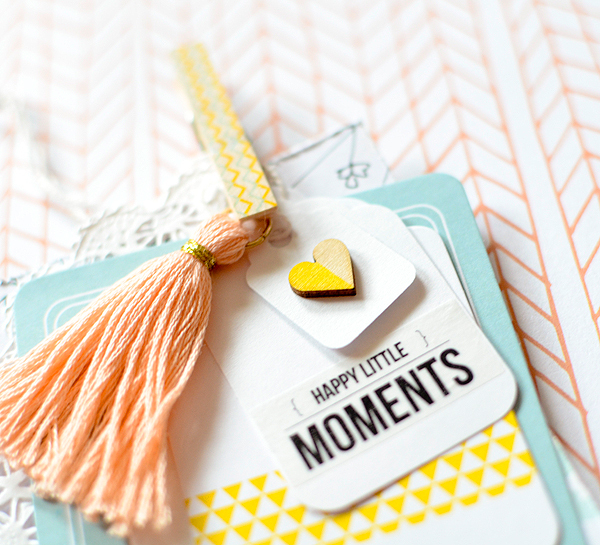 The 'Enjoy the little things' sentiment from the die cut pack is the perfect little message, adorned with a wood heart. 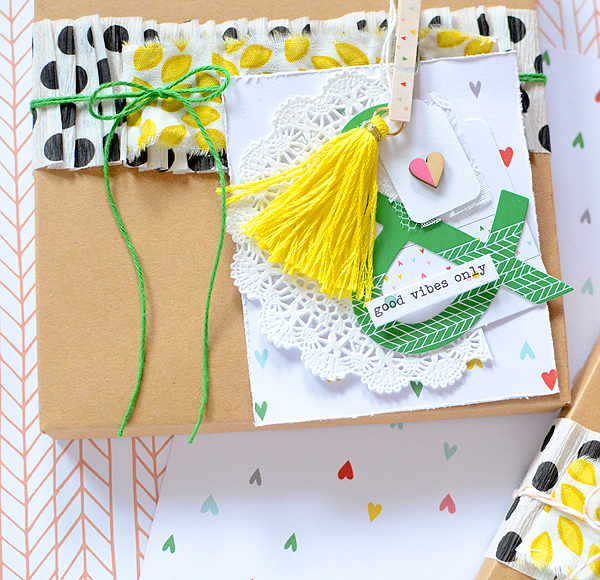 And it nestles sweetly inside a matching handmade envelope. Since leaves and birds are symbolic of springtime, those two washi strips seemed appropriate here. And the matching envelope? Made with the bird on the wire paper, of course! Thanks for stopping by today! You'll definitely want to get your hands on the Felicity collection when you see it; as the name suggests, it's going to make you nothing but happy! Absolutely gorgeous...simply love your style and big congrats! Rebecca, I found you at W&W - congrats on a fabulous post there, by the way - had to stop over to get another dose of gorgeousness ... holy wow!!!! You've freshened up 'girly', girl!! !